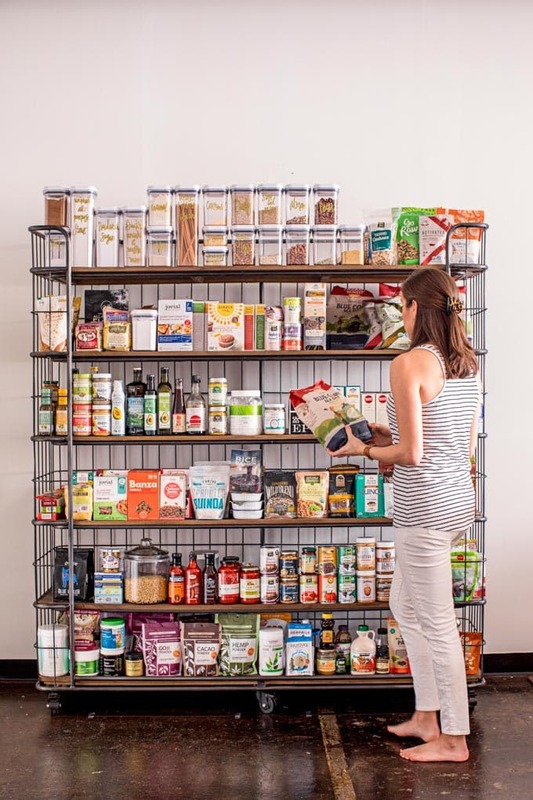 Learn how to stock a healthy pantry to make eating healthy easy! Here’s a peek of my real food pantry staples, complete with a healthy pantry checklist you can take with you to the grocery store. We talk a lot about what eating healthy really looks like in real life around here. I am a firm believer in eating mostly real food. I’ve seen the power of the anti-inflammatory diet and follow it most of the time as part of my 80-20 rule (or everything in moderation mantra). And I keep my fridge stocked with nutrient-dense foods so that healthy eating is easy. Same goes for my pantry. 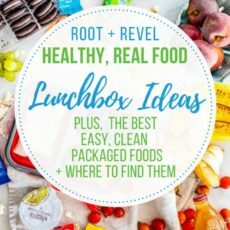 Coupled with meal planning, stocking your kitchen with real food is essential for eating healthy–if you always have good-for-you foods at your fingertips and no processed junk to fall back on, you won’t be tempted to make poor choices and you’ll always have something healthy to eat ready to go! RELATED: WHAT’S IN MY ALL-NATURAL MEDICINE CABINET? 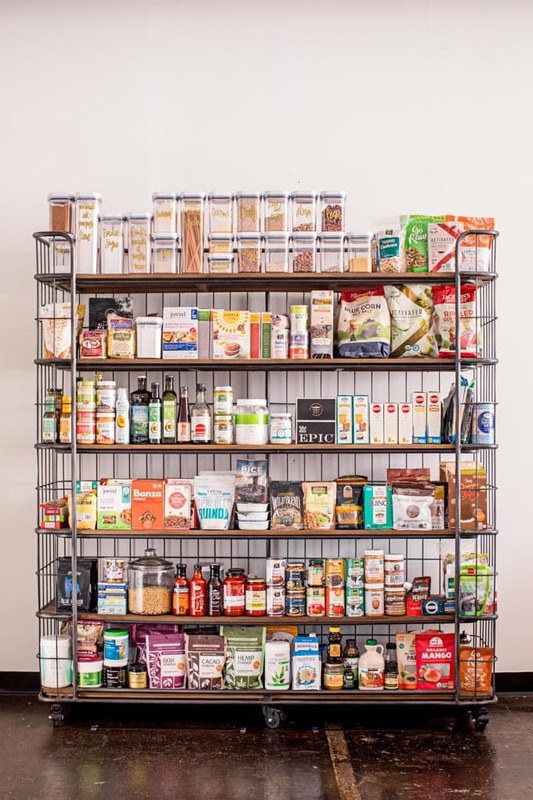 So I wanted to share some of my favorite pantry essentials with you today to help you stock a healthy pantry. But before we get into the best healthy pantry foods, let’s start at the beginning. 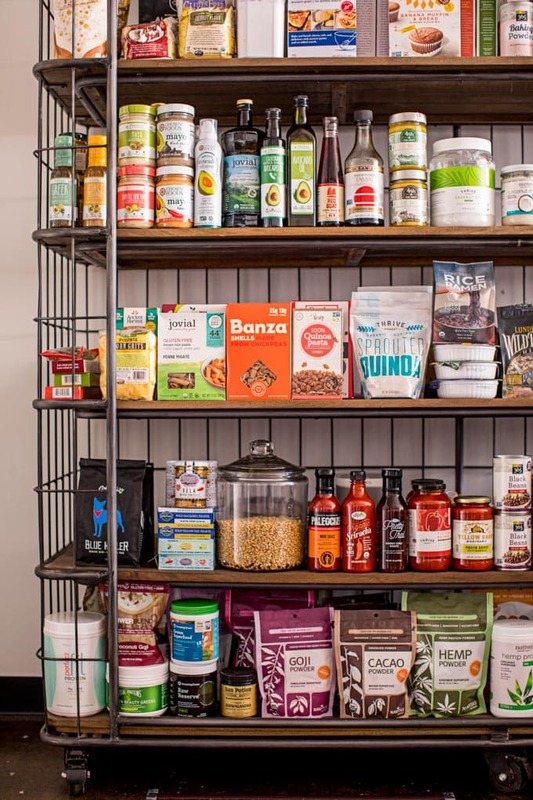 I do almost all of my perishable grocery shopping at Whole Foods and Sprouts, but when it comes to stocking a healthy pantry, I rely on Thrive Market and Amazon Subscribe & Save for most of my needs. In fact, I’ve shared with y’all before my favorite finds from Thrive Market, and you know the reason I do most of my shopping there is because it’s SO MUCH CHEAPER. I was skeptical at first, too–being the deal queen that I am, I figured the prices were probably not that much less. 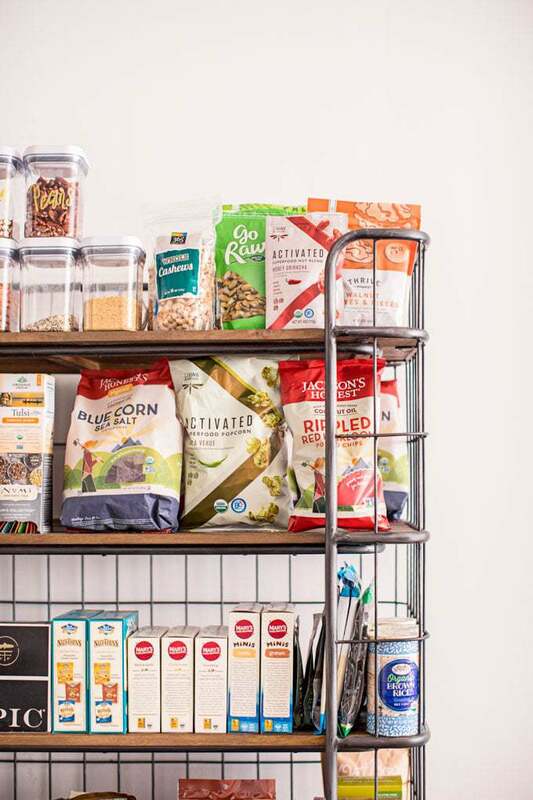 But over many months, I compared the prices at Thrive to mainstream grocery stores and retailers, Amazon and even Instacart and I’ve found that overall, most items are several dollars less at Thrive. Which may not sound like much, but adds up to A LOT OF SAVINGS! And because I love you so much, here’s even more savings for you! When you sign up for a Thrive Membership with this link, you’ll save an extra 35% off your first order, plus get a 30-day free trial and free shipping on orders over $49! Not only are Thrive’s prices always cheaper, but you’ll also find savings in the free gifts the company is constantly giving their members that you can expect these kinds with nearly every order you place–in nearly two years of being a member, I’ve never not received a free gift like this, and sometimes they’ll send you discount codes too. 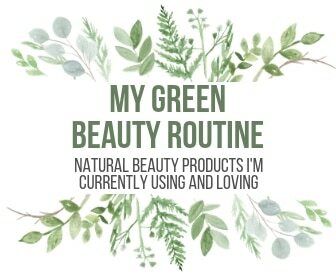 Once I got $35 off my order of $75–combined with the everyday savings and free gifts, the price of your membership will be paid for in no time. OK, I’m getting off my Thrive soapbox. 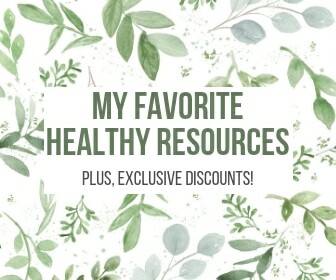 When I’m not shopping there, I’m usually buying my healthy pantry staples from Amazon Subscribe & Save, where I always save at least 15% off the list price, which is usually cheaper than most stores already. So, on that note… let’s get into it. 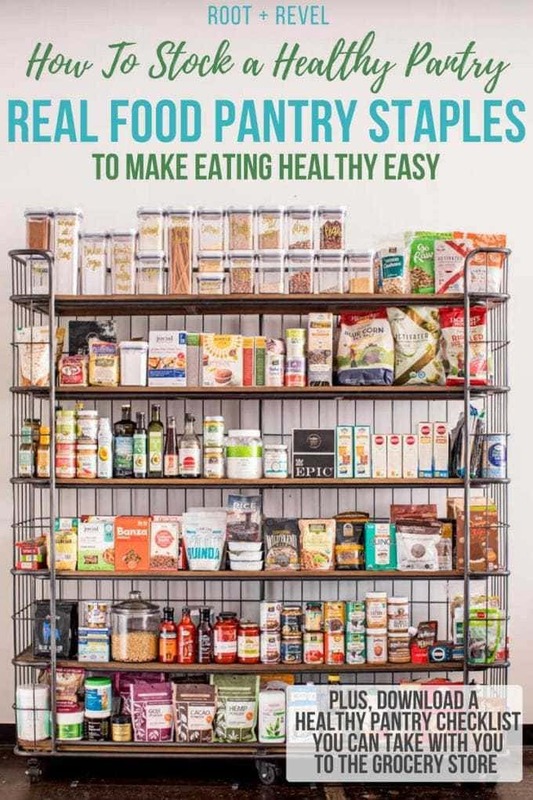 Though stocking healthy foods is the key to healthy eating, I must admit that pantry organization is another critical component. If bags and jars and cans are just shoved willy nilly into a black hole and you can’t even see what you have, you can kiss healthy eating goodbye. 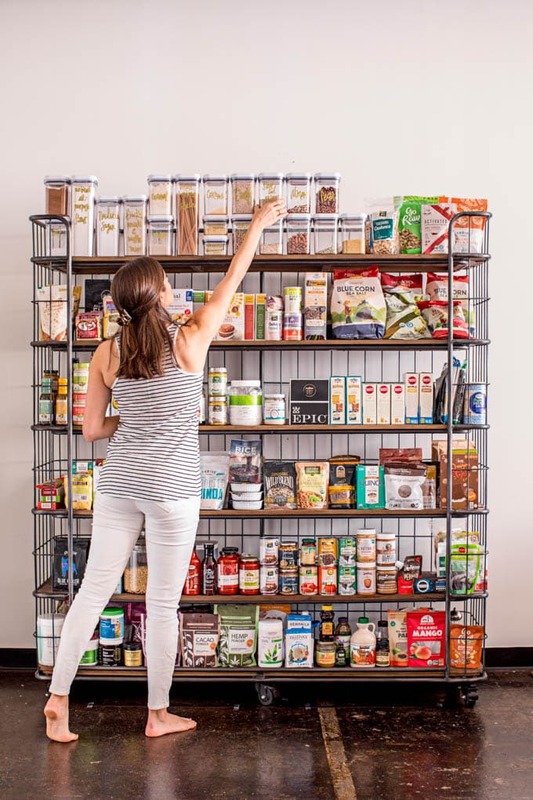 Make Space: Create a pantry that’s large enough to display all of your foods. If you have a pantry closet or cabinet or shelves, awesome! If, like me, you live in a home that’s lacking in built-in pantry space, create your own. I bought this beautiful baker’s rack pantry from Restoration Hardware and it’s quickly become my favorite piece in our home. Smart Storage: Use clear food storage containers to display dry goods, from flours and sugar to nuts, rice and pasta. I use OXO’s Good Grips Pop Containers, which are BPA-free, and glass storage containers from Crate & Barrel. **Note: This is just how my pantry is organized, but I encourage you to come up with a personalized organization method that works for you. Alright, now that we’ve got laid the groundwork, let’s talk FOOD! 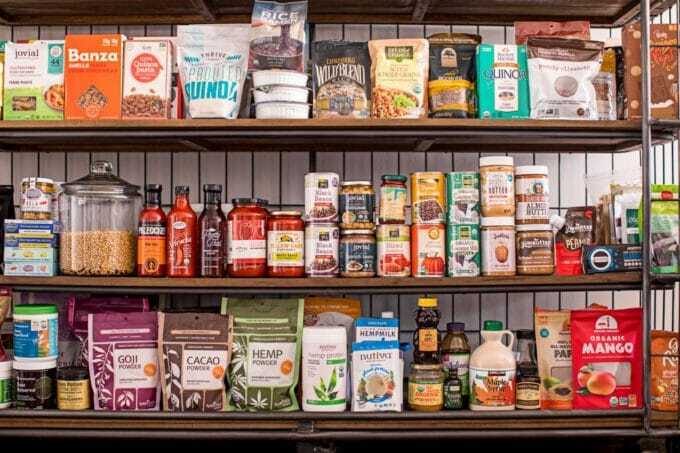 Below are the healthy pantry staples that I stock my pantry with–all of these items are organic and non-GMO when possible, made with real foods (i.e. short and recognizable ingredient lists) and many are often gluten-free, dairy-free and refined-sugar-free. Though I try not to be too dogmatic about what I eat, I do try to avoid gluten, dairy and refined sugar when I’m at home and save those foods for eating out or special occasions when it’s harder to control the ingredients yourself. So let’s start at the top and work our way down. Raw, Organic Nuts + Seeds: Snacking on nuts is a great way to get healthy fats and protein in, without harmful additives. I usually buy these in bulk or from trustworthy brands like Go Raw and Thrive Market’s private label. I also recently started buying Living Intentions Activated Nut Blends and love their flavor-packed spices and superfood twist. Jackson’s Honest Chips: I am addicted to their organic blue corn tortilla chips, which are made with coconut oil, and their potato chips, which are super crunchy and delicious. I always buy a few bags when I’m shopping at Thrive. Sprouts Organic Brown Rice Cakes: I love keeping a few stacks of these rice cakes on hand and topping them with nutrient-dense foods like avocado, butternut squash and yogurt or hummus and veggies. Get some recipe ideas here. SeaSnax Roasted Seaweed: I absolutely love snacking on roasted seaweed sheets–they’re crunchy, low-calorie and full of that addicting umami flavor. A lot of brands use inflammatory oils, but SeaSnax roasts theirs in olive oil. I buy the big family packs and cut the large sheets into smaller sections with scissors. Gluten-Free Crackers: Whenever we’re having people over and I need to put on some crackers, I always turn to Mary’s Gone Crackers. They’re super crunchy, full of nutritious seeds and gluten-free grains and always a crowd pleaser (and their gluten-free graham crackers are also ridiculously delicious!). I also love Simple Mills crackers (their Farmhouse Cheddar is so delicious, like a cross between Cheez-Its and Wheat Thins) and Jilz Crackerz. They’re not quite as clean, but I do also enjoy NutThins from time to time. Meat Bars + Jerky: When it comes to protein bars, I’m not a huge fan of most sugar-laden bars. But I do love the dried organic, grass-fed meat protein bars from brands like Epic. My favorite flavor is Chicken Sriracha (sometimes I buy these on Amazon because it’s cheaper there), but they’re all delicious. And, I know it sounds weird, but I also like snacking on their beef liver bites–they’re super high in Vitamin A + B, iron, zinc, and essential fatty acids, which are great for skin and thyroid. Real Food Snack Bars: When I am in the mood for something a little sweeter, Health Warrior’s Chia Bars and Pumpkin Seed Protein Bars really hit the spot! As I said, I’m not a fan of overly sugary bars, which is why I love these bars so much. First, they’re made predominantly with superfoods (chia seeds, pumpkin seeds) and are plant-based, gluten-, dairy-, GMO- and soy free. The Pumpkin Seed Protein Bars are organic with eight grams of protein and simple ingredients like pumpkin seeds, honey and the spices for the flavor–it’s like a healthy candy bar! The Chia Bars have even less sugar with just three grams, making them a really healthy snack. 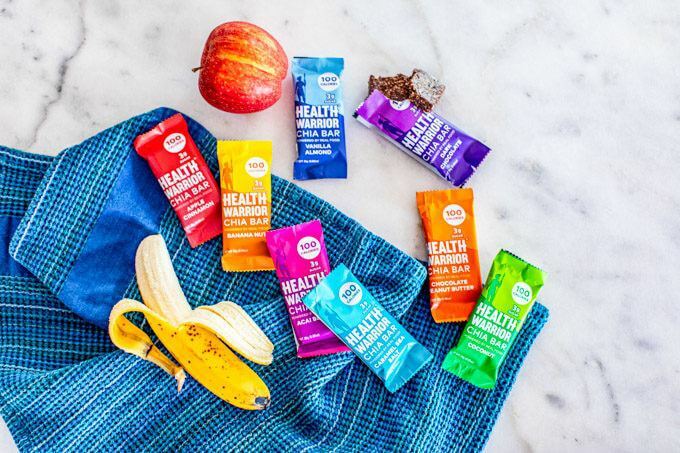 You can buy Health Warrior’s Bars direct through their website (where they have a ‘best price guarantee’ AND you can get 20% off your order with the code rootandrevel20, whoop! ), on Amazon or at Thrive Market. Dessert: For healthy sweet treats and desserts, I usually eat a piece of dark chocolate (if you haven’t tried Eating Evolved’s coconut butter cups, you need to go buy some RIGHT NOW!). I also have recently fallen in love with Simple Mills cinnamon cookies (they’re gluten-free and made with a short list of real foods), and often reach for dried fruit when I’m craving something sweet. I’m obsessed with Mavuno Harvest’s dried organic mango. Tea: I also love to stock up on organic teas. Pique Tea is one of my go-tos–I love the way their crystals dissolve in cold and hot water, no tea bags or steeping required. Numi Organics is another one of my favorite brands of tea because of their commitment to quality using all organic, fair-trade and full leaf teas (meaning the resulting flavor is more smooth and even). 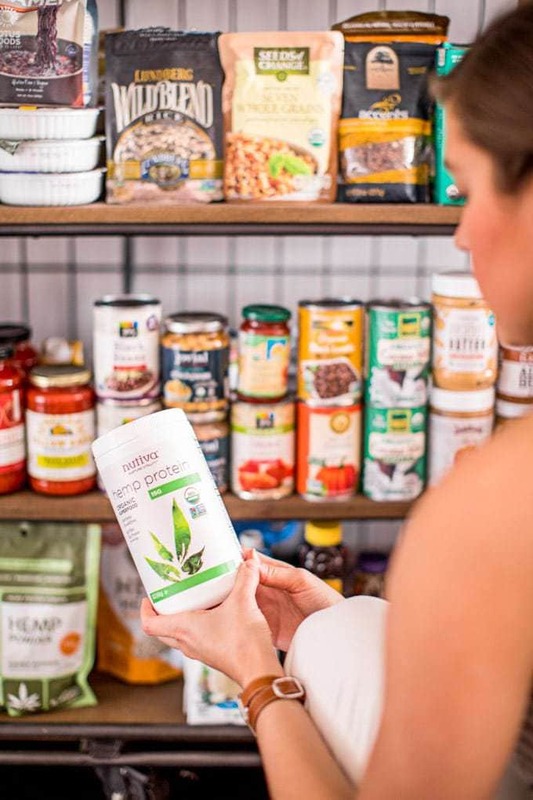 And Traditional Medicinals is an amazing line of wellness teas formulated by trained herbalists who use combinations that have been helping people for centuries. Moving down the line, the next area is where I keep my cereals, granolas, grains and baking goods. Gluten-Free Grains: To help with digestion, I try to buy organic, sprouted grains, though at the very least I at least try to stick to naturally gluten-free options, like quinoa, lentils, rice. Ancient Harvest, TruRoots, and Lundberg’s are my favorite. And for quick weeknight meals, I often use microwavable rice options from Seeds of Change and Lotus Foods. Gluten-Free Pasta: When it comes to pasta, I always buy gluten-free varieties. 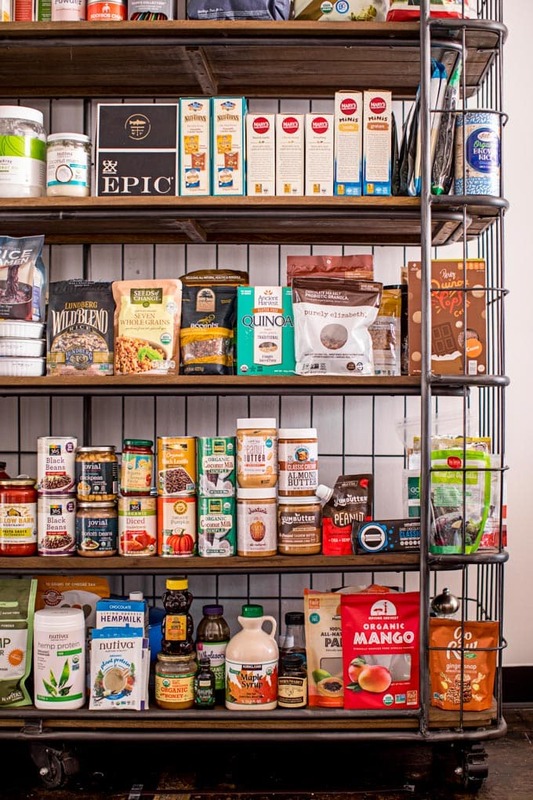 It took some trial and error to find the best ones, but the brands that I use the most are Jovial’s Brown Rice Pastas, Banza Chickpea Pastas, Ancient Harvest Quinoa Pastas and Explore Cuisine’s Black Bean and Lentil Pastas. I swear the texture is as lovely as any white pasta variety (and way better than overly dense whole wheat pasta), but you’re getting so much more nutrition. Granola: Purely Elizabeth is my absolutely fave; their Chocolate Sea Salt will change your life, and I love her grain-free and probiotic granolas, too. Baking Flours + Mixes: I don’t bake much, but when I do, I try to use gluten-free flours. Bob’s Red Mill (I love their all-purpose gluten free flour because it’s just a simple 1:1 swap), Jovial’s gluten-free flours and ancient grain flours, and Simple Mills Grain-Free Baking Mixes (these are much more my style since all you have to do is all eggs and oil, no recipe required!) make my favorites. Natural Sweeteners: In place of refined sugar, if I need to add sweetener to anything, I rely on organic maple syrup, raw, organic honey, blackstrap molasses, and organic extracts, like vanilla or almond. If I absolutely must use sugar, I always use organic, raw coconut sugar. And, of course, no pantry would be complete with oil, vinegar and condiments. Good-for-you Oils: When it comes to oils, I always buy organic, extra virgin, cold pressed oils. 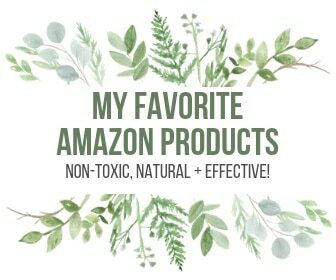 My favorites are coconut oil, 4th & Heart ghee, avocado oil (I use Primal Kitchen’s high heat avocado oil for cooking and Chosen Foods’ spray for roasting veggies), and Jovial’s extra-virgin olive oil (I also buy Costco’s olive oil). And when I need a quick spray oil, I also love Kelapo’s Coconut Oil spray. Asian Condiments: I also often rely on Red Boat Fish Sauce and San-J Organic Tamari (reduced sodium), as I’m addicted to Asian flavors. Pretty Thai makes amazingly clean and authentic Thai sauces and seasonings, as well, and, of course, I always keep sriracha on hand. Hot Sauce: Speaking of hot sauce, when I’m not using sriracha, it’s usually Cholula. And I always have a bottle of clean buffalo sauce (Paleo Chef and Tessemae’s make my favorites). Mayonnaise: When it comes to mayonnaise, I love Primal Kitchen’s avocado oil mayos (it comes in plain or flavors like Chipotle Lime, which is delicious!) and Chosen Foods (their black garlic and harissa mayos are insanely good!). Salad Dressing: I also keep salad dressing on hand for busy times–Primal Kitchen makes my favorites (as does Tessemae’s, but those have to be refrigerated). Then it’s down to my canned and jarred goods. Beans: I always keep plenty of organic, no-salt-added beans on hand. The only ingredient I want here is the beans themselves, and I look for BPA-free cans. I usually buy Whole Foods 365 brand, but Jovial makes some beautiful beans in glass bottles, too. Other brands, like Eden Foods, are too expensive, in my opinion. Tomatoes: I always, always have at least a few cans of organic, no-salt-added diced tomatoes on hand (Whole Foods 365 brand or Jovial’s), plus tomato paste and some clean jarred tomato sauce (Yellow Barn and Thrive Market’s private label are my favorites). Coconut Milk: To avoid dairy at home, I often cook with coconut milk. Native Forest’s Organic Simple label is my go-to–it’s only got one ingredient (organic coconut), unlike other brands which are full of added gums. I buy them in bulk on Amazon because it’s the cheapest. Nut Butter: I put nut butter on just about everything, so I always keep a few different kinds on hand. 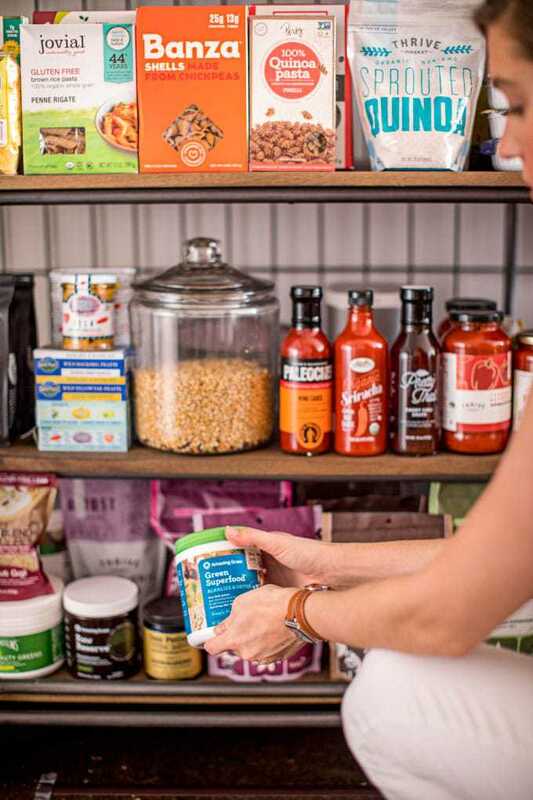 Some of my favorite brands include Georgia Grinders, Yumbutter, Wild Friends and Thrive Market. On the bottom shelf, you’ll find all my superfoods, which go into smoothies and coffee drinks. Superfood Powders: Navitas Naturals is my go-to for superfoods like cacao, goji, acai. Amazing Grass makes incredible green superfood blends that are awesome in smoothies, and Sun Potion’s adaptogen powders, like ashwagandha and rhodiola, are awesome additions, too. I also LOVE Four Sigmatic’s Mushroom Coffees and Cocoas, which are made with adaptogens and calming mushrooms. Plant-based protein: I try to avoid whey and other dairy protein powders in favor of plant-based protein. I usually rely on hemp seeds, and Nutiva makes some really great clean hemp protein powders. I also love Vital Proteins collagen powders (this isn’t plant-based but it’s SO good for you!) and Perfect Fit’s vanilla protein when I need something sweeter. I also like the unflavored varieties of Amazing Grass’s protein powders. Wild-Caught Canned Seafood: Yep, wild-caught canned fish is indeed a superfood, packed full of omega-3s. I keep a few different kinds of canned fish in my pantry, which is awesome for quick lunches. I buy Safe Catch’s low-mercury tuna, and Wild Planet’s wild-caught salmon, yellowtail, mackerel, sardines and the like. Alright, so there you have it. These real foods are how I keep my pantry stocked so that healthy snacks and meals are always quick and easy to make. To help you stock your own healthy pantry full of nourishing foods, I’ve created a healthy pantry checklist you can take with you to the grocery store. 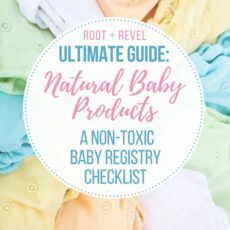 Just click here to download the list! What’s in your pantry? Share in the comments below. I’d love to hear from you! Hi! I am trying to download the pantry checklist, but I am having some problems. I put my information in the box, but then it asks for a password before I can see it. What is the password? So, I have the password now and I will enter it, but then my screen just turn white and won’t load. What am I doing wrong? Haha, thanks! Help – I’ve filled out the info to download the pantry checklist but when I follow it back, I can go to the resource page but when I click on the pantry checklist, it opens the real food sheet next to it. Perfect- works now. Thank you. Hi: Love this list and resources. However, the Thrive marketplace 25% discount seems to be having some trouble, and just hangs when I try to join. Could you help out with that? Thanks! Finally, it just worked. Thanks! This lady! 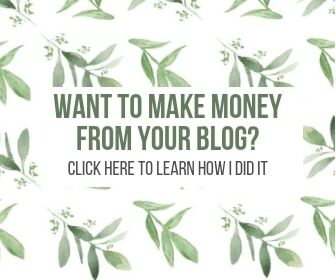 What a blog, look at all of these resources. Holy helpful! 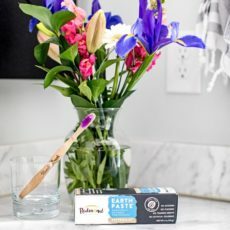 I’m a new blogger, currently writing my own pantry staples post and I went searching for some examples to make sure I had a decent idea. I aspire to someday be this helpful! I can’t wait to try Thrive market now! Thanks so much for all of these links and resources. Staying on track is so difficult in society as it is today. I’ve lost about 119 lbs, I’ve just a go few more to reach my goal and I’m always on the lookout for ways to keep me thoroughly entrenched in the good fight. Thank you again!